Our feathered friends explore the ocean depths in Rovio's free downloadable content. Angry Birds Seasons is by far our favorite game in Rovio Entertainment's series, largely because the company continues to release free updates throughout the year. The newest sends those ticked off birds underwater to the mysterious Piglantis. 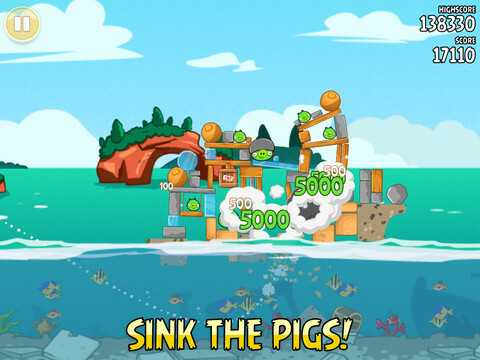 Currently available for free, this new piece of downloadable content adds another 30 all-new levels to the game, along with underwater physics where the birds float and their arch enemies, those nasty green pigs, sink like the dumb rocks they truly are. It's been a few months since we fired up Seasons. That said, Piglantis, here we come.